I am looking for Lillian Landon, born in 1877, who married Peter Solberg in 1903. They lived at 1813 N Chatham. Lillian was Peter’s second wife. Peter Solberg died unexpectedly in 1916. I am trying to find out what happened to Lillian after her husband died. Thanks for your help! I am looking into my family history. 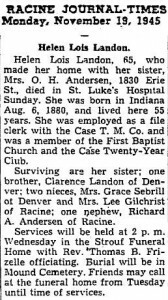 Lillian Landon-Solberg would be my step-great-great-grandmother. 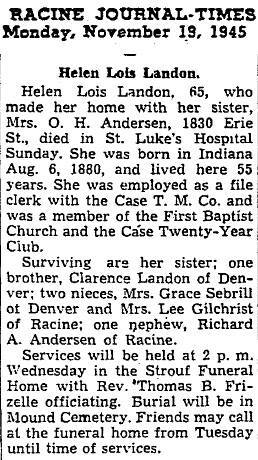 I found some record indicating she was born 1877 and died 1928. I have no other information right now.